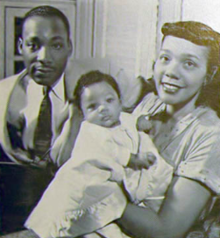 ^ Schraff, Anne E.. Coretta Scott King: striving for civil rights. Enslow Publishers. p. 14. ISBN 0894908111. https://books.google.com/books?ei=9BXlUua2EeGqyAGs3IG4DA&id=ez47z1Dy-wUC&dq=%2B%22coretta+scott+king%22+%2B%22part+native+american%22&focus=searchwithinvolume&q=mollie. ^ Bruns, Roger (2006). Martin Luther King, Jr: A Biography. Greenwood Publishing Group. p. 25. ISBN 0313336865. https://books.google.com/books?id=lS7EwqsetryjurhgsefrgthyjutyrhgstyjuhmgftrO1vbE7AC&pg=PA25&lpg=PA25&dq=Bernice+McMurray+Scott+indian&source=bl&ots=zl-g0Nu_Gq&sig=anKUQATy-BwuK-lvapjNvaK27gg&hl=en&sa=X&ei=s5HiUaqIM4LorAGJ_IGoCw&ved=0CEQQ6AEwAw#v=onepage&q=Bernice%20McMurray%20Scott%20indian&f=false. ^ Bagley, Edyth Scott (2012). 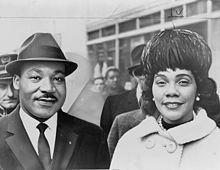 Desert Rose: The Life and Legacy of Coretta Scott King. Tuscaloosa, Alabama: The University of Alabama Press. pp. 17–19. ISBN 978-0-8173-1765-2. https://books.google.com/books?id=SqGlEFVit2IC&printsec=frontcover#v=onepage&q&f=false. ^ a b c Garrow, pp. 59–60. ^ a b c d Garrow, p. 61. ^ a b c Vivian, p. 20. 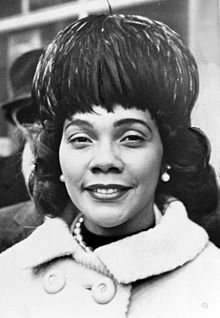 King, Coretta Scott (1969). My Life with Martin Luther King, Jr.. Puffin. ISBN 978-0140368055. Nazel, Joseph (1997). Martin Luther King, Jr.. Holloway House Publishing Company. ISBN 978-0870675737. Frady, Marshall (2002). Martin Luther King, Jr.: A Life. Penguin. ISBN 978-0-14-303648-7. https://books.google.com/books/about/Martin_Luther_King_Jr.html?id=dOR4QpEE0g8C. Clarke, Thurston (2008). The Last Campaign: Robert F. Kennedy and 82 Days That Inspired America. Henry Holt and Co.. ISBN 978-0805077926. Darby, Jean (2005). Martin Luther King, Jr.. Lerner Pub Group. ISBN 978-0822524717. Dyson, Michael Eric (2000). I May Not Get There with You: The True Martin Luther King, Jr.. Free Press. ISBN 978-0684867762. Fairclough, Adam (1995). Martin Luther King, Jr.. University of Georgia Press. ISBN 978-0820316536.